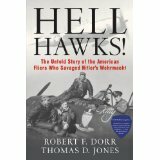 Home » Uncategorized » Veterans to be Honored.The Hell Hawks, Fighter Pilots in the Trenches. Veterans to be Honored.The Hell Hawks, Fighter Pilots in the Trenches. The 365th arrived in the European theater just prior to D-Day, June 6, 1944, and flew their last mission the day the Nazis surrendered on May 7, 1945. During the Allied Forces advance across Europe, the group‘s operating base was constantly moved forward to provide easy access to the front lines. For both pilots and maintenance crews, this meant a daily routine of living in tents surrounded by cold mud; like the GIs they were supporting. On New Year’s Day 1945, the Hell Hawks found themselves on the receiving end of their own tactics. Early that day two Groups of Luftwaffe Bf 109Gs attacked the 365th operating base near the Alsatian city of Metz. Their intent was to destroy the base and loosen the Allied hold on the airspace over The Bulge. The raid took the Hell Hawks by surprise, and left most of their aircraft badly damaged or completely destroyed. But they maintained their grip over The Bulge; because in just a few days after the attack, their ramp was filled with shiny new aircraft fresh from the factory. This was not surprising considering that America manufactured nearly 100,000 aircraft in 1944. When one of the Luftwaffe pilots who was shot down and captured near the airfield was shown the line of new aircraft, his only comment was ” Ja, That is what is beating us!”. My Review for Interested Readers. One of the things I like about Hell Hawks is that it is written with the careful precision of a historian; while at the same time containing enough photographs and personal recollections to make the story come alive. A Five Star book that earns a place on every aviation historian’s library. Hell Hawks is published by Book Surge Publishing and can be ordered at major online book sellers including Amazon.com and Barnes and Noble.It can also be downloaded to Kindle.